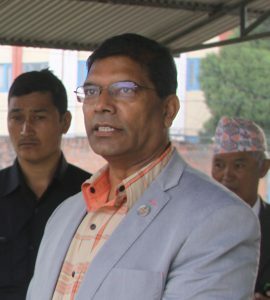 KATHMANDU, March 7: Minister for Culture, Tourism and Civil Aviation, Jeevan Bahadur Shahi has said the government is serious on preserving the lakes which are the centre of tourist attraction. Speaking in the programme titled 'Protection of Lakes and Wetlands for Promotion of Sustainable Tourism' organised on the occasion of the 11th anniversary of tection and promotion of lakes would contribute towards increasing the number of tthe National Lakes Protection and Development Committee here Monday, he said proourists coming to Nepal. Minister Shahi also underlined the need of including the preservation of lakes and wetlands in the school curriculum. He said all sides should work together for the protection of the lakes. Member of the Nepal Tourism Board, board of directors, Krishna Kumar Aryal said the Board would work together with the Committee for the preservation and promotion of lakes as it was necessary for the development of the tourism sector. Committee chairman Nailkaji Thapa urged the government to declare the 23rd of the Nepali month Fagun as the National Lakes Day for creating extensive public awareness for the development, promotion and protection of lakes and wetland areas. There are 5,358 natural lakes in Nepal at present. Of these lakes, 51 percent are located in the Tarai, eight percent in the hilly region and 41 percent in the mountainous region. Humla district alone has the largest number of lakes in the country. It has 381 lakes, big and small, according to the Committee.